The directors are pleased to announce the promotion of Rachel Hallam to the position of Associate at Abell Nepp Architects. Rachel has been with us for over 4 years and has demonstrated the commitment, values, leadership skills and passion to advance into this important position within the Practice. Recently celebrating Abell Nepp's 9th year, we are confident that Rachel will be play a pivotal role in shaping the future direction of Abell Nepp. ISG held their inaugural Cycle for Charity to raise funds for Macmillan which was supported by three Abell Nepp riders who completed the 40 miles course slightly faster than Chris would have ideally preferred! Abell Nepp has provided User briefing, internal laboratory planning and fit-out design services for the building which will provide a focal point for interaction between researchers and clinicians, right in the heart of one of Europe's largest medical research facilities. Professor Jim Johnson, Head of Research, Novo Nordisk Research Centre; Jeremy Eavis, Operations Director, Mace; and Dr Elen-Wade Martins, Business Manager, BioEscalator, fastened engraved golden bolts at the topping out ceremony. Abell Nepp, with Lead Architect Hawkins\Brown, and BuroHappold Engineers, has won the competition to design the new home of the London Institute of Medical Sciences (LMS) ahead of 12 rival bids. The project is a joint undertaking by the Medical Research Council (MRC) and Imperial College London (ICL) and is seeking to provide modern research facilities which will support world leading science. It is envisaged to contain high-tech imaging facilities and modern laboratories. Abell Nepp is the Laboratory Specialist to the Principal Contractor Morrison Construction. The project is the relocation of an existing function and will showcase the quality process on the Montrose site for staff and visitors. The new laboratory suite will improve compliance and safety through improved circulation routes with mobile laboratory benching allowing easy adaptation for new processes. Construction starts in October 2017. Abell Nepp has won a design competition to modernise and expand the Chetwynd Court and lower levels of the surrounding buildings, and has completed RIBA Stage 1 services. Grade I and II listed buildings partly enclose the Court which is in the southeast quarter of the College grounds. 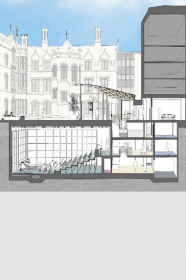 The existing buildings will be linked by a new glass 'Pavilion' in the SW corner of the Court. The surrounding ground floor spaces will be refurbished to meet the requirements of students and staff, including new social, academic and conference areas, in addition to a coffee shop and bar. To minimise heritage impact, an underground building beneath the Court will house a 200-seat multipurpose auditorium, for events and performances. The space will support a wide range of acoustic environments: from classical recital to speech to electro-acoustic. Abell Nepp are laboratory planners for AstraZeneca's new £330m Global R&D Centre and Corporate Headquarters at the Cambridge Biomedical Campus. Herzog & de Meuron is the concept architect for the building with Abell Nepp appointed through the Executive Architect and Engineer, BDP. The 'topping out' milestone was reached on April 25, 2017 and celebrated by: Pascal Soriot, CEO, AstraZeneca; Mene Pangalos, Executive Vice President, Innovative Medicines and Early Development Biotech Unit; and, Professor Duncan Maskell, Senior Pro-Vice-Chancellor, University of Cambridge. Bruce Nepp has been appointed to the Advisory Board of SEFA (Scientific Equipment and Furniture Association) for a three-year term. The Advisory Board is composed of international leaders in the design and planning of laboratories. Abell Nepp will be speaking at SEFA's 2017 Laboratory Design Conference in Madrid in September. The University of Cambridge has appointed the team of Allies and Morrison, Abell Nepp, BuroHappold and LDA Design to develop masterplan proposals for its Biomedical Campus. The new effort will establish a framework within which the University can develop more accommodation for teaching, research and clinical facilities in the life sciences, which will include a major hub for neuroscience. Through all of this we have kept our sanity, our houses, our sense of humour and we are still having fun. The Francis Crick Institute, Europe's largest biomedical laboratory has opened. Located behind St Pancras station, the £650m building will accommodate 1,250 scientists. The Institute is a partnership between the UK's three largest funders of biomedical research: the Medical Research Council, Cancer Research UK, and Wellcome Trust, plus University College London, Imperial College London and King's College London. During the early design stage, Abell Nepp provided peer review services and space utilisation benchmarks. Later on in the process, Abell Nepp was the Science Area Advisor to the Principal Contractor, Laing O'Rourke, and provided technical expertise in reviewing buildability concepts and tender packages leading to a complex mock-up programme for testing and approval of all repetitive laboratory elements. Two buildings designed by Abell Nepp for the world-renowned genomics and biodata campus, the Wellcome Genome Campus in Hinxton, Cambridgeshire, have been selected as finalists in Blueprint Magazine's 2016 Design Awards. The Conference Centre project has been nominated in the Best Public-Use Building (Privately Funded) and Best Interior Project (Work) categories. The £10.5 million project encloses the heritage Kitchen Garden, and provides new breakout, exhibition and catering facilities to the Grade II* Hinxton Hall complex located in the Conservation Area of the campus. The £5 million Shared Facilities Collaboration Hub, replaces the original 1990's facility, maintaining only the roof and structure, providing new cafe, library, meeting rooms and classroom for the campus. Chris Abell achieved his long-standing ambition of running the London Marathon. He ran it in 4:14 and raised over £3,500 for the RNLI. Thank you to everyone who donated to this great cause. Practical completion has been achieved for Phase 1 of this renovation and extension of Oxford BioMedica's facility for cell therapy research, development, and manufacturing. Abell Nepp provided full architectural and lead consultancy services on the project which forms part of a phased redevelopment of the site. It includes a new suite of GMP ISO 5, Class 100 clean rooms. Oxford BioMedica are a spin-out company of Oxford University. The project was supported by Finance Birmingham's AMSCI programme which provided a grant for the project. Abell Nepp is providing Laboratory Planning services to Allies and Morrison for Imperial College London's £80m Michael Uren Biomedical Engineering Research Hub. The 13-storey centre, 10 storeys of which are research labs and offices, will be built at the new Imperial West Campus. It will contain medical technology to aid research on variety of conditions and enable Imperial's scientists and clinicians to work with external companies to increase innovation. In addition, an integrated outpatient clinical facility and medical imaging suite will provide patients with direct access to innovations in healthcare. FX Interior Design Magazine has listed two of Abell Nepp's projects as finalists for their 2015 International Design Excellence Awards. The Wellcome Genome Campus' Shared Facilities project and the EMBL-European Bioinformatics Institute's South Building have been selected for the Public Sector category. The Shared Facilities project involved refurbishing a library, café, meeting rooms and classrooms. The EMBL-EBI South Building provides bioinformatics research space and training facilities. Both projects are located on the Wellcome Genome Campus in Hinxton, Cambridgeshire. The award winners will be announced at the FX's Awards Event in London in November. Chris Abell spoke at the 2015 S-Lab conference held at Leeds University on 16-17 September. He joined the stage with Cullen Whyte (Eli Lilly UK) and Alan Fox (AECOM) to present 'Maximising Opportunities for Lifelong Science - Laboratory Refurbishment at Lilly UK'. The talk explained the multi-phase refurbishment programme that has delivered 25% energy savings compared to previous site refurbishments. Designed by Abell Nepp, the laboratories are flexible to allow either chemistry or biology functions, and provide visual connectivity between labs and write-up areas. In June 2015, Dan McArthur spent three weeks in Guatemala, assisting the charity Constru Casa in the construction of basic homes and community facilities for families living in extreme poverty. Whilst with the charity Dan spent time extending a family home in Santa María de Jesús, assisted in the construction of the Ciudad Vieja Niños de Guatemala secondary school, and spent a few days developing designs for a medical clinic. Practical completion has been achieved on the Kitchen Garden Enclosure project for the internationally-renowned scientific conference centre. Designed by Abell Nepp and ARUP engineers, the glazed elliptical roof encloses 1600m² of exhibition and breakout spaces, and a bar/café, all within a historic walled garden. The roof appears deceptively simple spanning between the heritage walls and enveloping the existing 1990s auditorium. Its parametric geometry delivers a low profile, sensitive to the massing of the Grade II* Manor complex, whilst creating a dramatic internal space. The three-ply translucent and clear roof glazing is 'cold-bent' up to 47mm, to achieve a smooth profile, controlling internal daylight and maintaining comfortable temperatures. A team from Abell Nepp has (surprisingly) completed the London West Tough Mudder challenge, so far donating and raising over $3800 for the Guatemalan charity Constru Casa, including a donation from Abell Nepp. The team endured a ten-mile run, ice bath, mud pits, barbed wire, and electric shocks, among other obstacles. Dan McArthur from Abell Nepp is now taking a summer sabbatical to help Constru Casa with the construction of basic housing in Guatemala. Abell Nepp's EMBL-European Bioinformatics Institute's South Building in Hinxton, Cambridge has been shortlisted for RIBA East's 2015 Regional Design Awards. The £18m BBSRC-funded building provides bio-informatics-related research space for over 200 researchers and the ELIXIR Directorate, the new European infrastructure for life science data, and training facilities for their international programme. Abell Nepp was the Architect and Lead Consultant for the 5,000sqm design and build project. The Wellcome Trust Conference Centre celebrated the 'topping out' of its Kitchen Garden Enclosure project. Infilling the walled garden, the project provides exhibition, café, and breakout spaces under a large glazed elliptical roof. Waagner Biro (Austria) fabricated the roof for the main contractor, RG Carter. Designed by Abell Nepp and ARUP Engineers, the roof appears deceptively simple. Spanning from the 'non-rectangular' heritage walls, it surrounds the 1990's auditorium. The parametric geometry delivers a low profile whilst creating a dramatic internal volume. The three-ply glazed panels are 'cold-bent' up to 47mm, to achieve a smooth profile. Translucent glazing panels provide daylighting whilst maintaining comfortable internal temperatures. The Shared Facilities building on the Welcome Trust Genome Campus has been reopened. The original social 'hub' for the campus (constructed in 1977 during the Human Genome Project campaign), was demolished keeping the roof and its structure, to modernise and enhance collaboration spaces and address environmental and acoustic issues. For use by the Sanger and EMBL-European Bioinformatics Institutes, the café and library have been co-located to encourage staff interaction. The Library provides a casual, mostly digital, environment for staff with access to the previously 'Hidden Garden'. The 'twisted boxes' relocate meeting rooms to the mezzanine to capture key vistas across the historic and newest parts of the campus. The 'boxes' are clad in dark metal acoustic panels that are accentuated by bespoke acoustic perforations representing nearly 100 molecules that share an important place in the history of the campus' genetic and genomic research. Abell Nepp have been providing laboratory planning services on AstraZeneca's new Global R&D Headquarters Building in Cambridge. Herzog & de Meuron is the concept architect for the £330m building. Abell Nepp have been appointed through the Executive Architect and Engineer, BDP. The building will co-locate all of AstraZeneca's UK R&D laboratories from Alderley Park and Granta Park (MedImmune). The planning application has been submitted for the extension and refurbishment of Oxford BioMedica's (OXB) manufacturing facility in Cowley, Oxford. After OXB secured an Advanced Manufacturing Supply Chain Initiative (AMSCI) grant, Abell Nepp was appointed in April 2014 as the architect for the expansion and reorganisation of the site. The proposal increases the manufacturing capacity of OXB's existing facility, together with infrastructure improvements and modernisation, but it also provides additional newly constructed clean rooms to accommodate future larger-scale/commercial manufacturing processes. Subject to planning, construction is expected to start early in 2015. A major milestone for the Wellcome Trust Conference Centre's Kitchen Garden Enclosure has been achieved: the frame of the parametrically-modelled glazed roof has been installed. The enclosure of the heritage Kitchen Garden, designed by Abell Nepp with Arup engineers, will create new space for conference centre breakout, exhibition, and catering space for the world-renowned scientific conference centre. Waagner-Biro of Austria have fabricated and are installing the complex skewed elliptical roof on behalf of the Contractor, RG Carter. Waagner-Biro are known for some of the most sophisticated steel and glass structures including the British Museum Library's atrium roof. The frame has been installed with working tolerances of 2mm for the entire structure during construction and when fully loaded. The Royal Free Charity has submitted the planning application for the proposed Pears Building. The new £30m building will house UCL's Institute for Immunity and Transplantation at the Royal Free Hospital campus in Hampstead. The building will contain three floors of research space, as well as an underground car park and rooftop Patient Hotel. Abell Nepp are providing laboratory planning services to Hopkins Architects. Abell Nepp celebrated its fifth anniversary providing architectural, interior design, and laboratory planning services. We wish to thank all our clients and colleagues who have assisted over the years and look forward to many more. Planning permission has been secured for a new £30m research facility at the University of Exeter. The 8000sqm building enlarges the science research facilities of the University's Streatham Campus. The Living Systems building is the first dedicated science building on the campus since the 1960s. It will feature wet and dry labs linked to the neighbouring physics building. Abell Nepp have been working with Hawkins/Brown who have developed the facade design with a visual artist, reflecting the research taking place inside the building. Construction on site is due to start in January 2014. Practical completion has been achieved for the £17m EMBL-European Bioinformatics Institute's (EBI) Technical Hub at the Wellcome Trust Genome Campus, Hinxton. This new BBSRC-funded building provides additional space and training facilities for the EBI. It will also host the ELIXIR project hub - the new European research infrastructure for life science data. Beginning in 2009, this was Abell Nepp's first commission, progressing from feasibility and government funding stages through to design and construction. A formal opening involving UK and European dignitaries will be held in October. South Cambridgeshire District Council has granted planning approval for the enclosure of the heritage Kitchen Garden for the Wellcome Trust Conference Centre (WTCC) in Hinxton. Located on the Trust's Genome Campus, the WTCC is one of the top three scientific conference centres in the world. Designed by Abell Nepp, new breakout, catering and exhibition spaces are created by enclosing the Kitchen Garden with an elliptical roof that responds to the massing of the Grade II* Listed Hinxton Hall and associated heritage buildings. Other team members involved in the project include Porta Planning, 3PM, Turner & Townsend CM and ARUP. Austrian firm Waagner Biro has been appointed to develop and construct the roof of Abell Nepp's Kitchen Garden Enclosure project for the Wellcome Trust Conference Centre on the Trust's Genome Campus; they will be novated to the Principal Contractor later in the year. Working with ARUP, the Kitchen Garden roof is a complex ellipse that encloses the space between the heritage garden walls and an existing lecture theatre. The roof lights are a combination of clear and translucent glazing panels providing optimal daylighting and thermal comfort to the new breakout and exhibition space. Walter Lilly was appointed Management Contractor for the first phase of a refurbishment of existing buildings for a pharmaceutical company in the South East. Abell Nepp is Architect and Lead Consultant, working with MEPS Engineers AECOM, and CDMC and Cost Manager Faithful + Gould. The phase, which extends the existing laboratory footprint with a new external envelope, is due for completion February 2014. Abell Nepp have previously worked with Walter Lilly at the National Physical Laboratory. Campus Director David Davison led the Topping Out Ceremony for the Delegates' Accommodation project on the Wellcome Trust Genome Campus in Hinxton. Contractor RG Carter is due to complete the 64-bedroom accommodation in October, one of a series of projects underway for the Wellcome Trust Conference Centre. Wates Construction was appointed as Stage 1 Contractor for Exeter University's £30m Living Systems Building. Abell Nepp is the laboratory planner for the multidisciplinary research building, working with MACE, project manager, and Hawkins/Brown, lead architect. The Cellular Genetics and Phenotyping Facility is formally opened at an event hosted by Professor Mike Stratton, Director of the Wellcome Trust Sanger Institute, on Monday 4 March. Construction of the £3m Cellular Genetics and Phenotyping Facility at the Wellcome Trust Genome Campus, Hinxton is completed. Arup and Evolve provided engineering design, with Morgan Sindall as Principal Contractor. The specialist suite of laboratories is the largest in Europe, providing CL2, CL3 labs and administration space. A formal opening will be held in March. Beatson 2 Translational Research Centre completed. Abell Nepp provided laboratory planning services for this £9m project at the University of Glasgow. Abell Nepp celebrates its 3rd anniversary by launching its new website. Abell Nepp wishes to thank all of its clients, collaborators, staff, and friends for contributing to its growth and success. Groundbreaking ceremony for the Delegates' Accommodation building at the Wellcome Trust Genome Campus. This is the first of a set of projects enhancing facilities for delegates for the world renowned scientific conference centre. AkzoNobel appoints Abell Nepp to undertake a feasibility study for the refurbishment of R&amp;D laboratories at their UK headquarters in Slough. Groundbreaking ceremony on the Wellcome Trust Genome Campus for the BBSRC-funded Technical Hub @ EBI for the EMBL - European Bioinformatics Institute. This &pound;20m building will host the pan-European ELIXIR Project. University of Exeter approves the Living Systems Building feasibility study developed by Mace, Hawkins/Brown and Abell Nepp.